The academic job search is competitive. Each step is important, because it opens the door to the next step. This video focuses on making a great first impression in the initial screening interview—to improve your chances of being invited for a campus visit. While you’ll never anticipate every question a search committee might ask, it helps to think through the possible topics with which you’ll be presented. 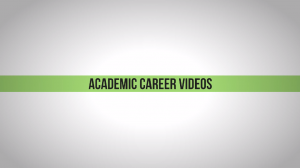 This video offers preparation hints as you enter the academic job market. You made the short list! You’ve been invited to the campus for an interview! You are probably elated and scared at the same time. This video helps you prepare for an intense 2-3 day visit, with practical advice that should help your time on campus go as smoothly as possible. Fit with the department: how does your work fit with their current faculty?